Back in 1997, Apple realized there was a market for computers designed specifically for classroom use. They had built much of their success on Apple II+ and IIe computers liberally distributed through schools, and, facing pressure from IBM and the ‘clone’ world, decided to leverage their moderate success with the Newton line of PDA’s. Thus, the Apple eMate 300 was born. Building on the Newton platform, Apple took the top end configurations of the Newton Messagepad 2000 and 2100, and built a small, laptop-like device. The touchscreen remained, with the stylus, backlighting, and much of the NewtonOS, but Apple added a keyboard, rechargeable internal battery, a durable case, mounting hardware for securing the devices to desks, and some additional management tools for teachers to be able to work with roomfuls of eMates. Other changes were the addition of an internal memory expansion slot that allowed the units to be upgraded with additional RAM or customized ROM cards. The device is quite attractive and easy to work with, light and easy to carry, and the 85% sized full stroke keyboard is comfortable to type on. As with all Newtons, it has no inherent networking support (short of Localtalk, a serial protocol used to communicate with printers and other similar devices), but does a PCMCIA socket that allows for network cards. 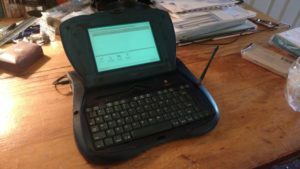 In many ways, the eMate laid the groundwork for the OLPC XO-1 computer which came out 9 years later. Unfortunately, the eMates only lasted less than a year, when Steve Jobs cancelled the entire Newton project after Gil Amelio was fired as the CEO of Apple. 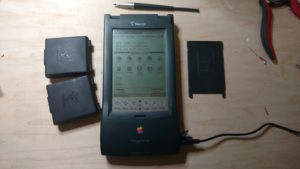 The Newton was Apple’s first handheld ‘tablet’ computer. The first generation of these were the 110, 120, and 130. They were pioneers in the handheld computing realm, bringing unseen features such as full handwriting recognition and high resolution (for the time) touchscreens , with an intuitive and easy to understand interface. The Messagepad 130 is interesting because it’s the first in the line to not only come with the vastly improved NewtonOS 2.0, but it included a backlight. The monochrome screens in all the Newtons is tricky to use in less than direct light, so this feature was a welcome addition.